In the not too distant future, with the face of the planet having been ravaged and torn apart by decades of hostilities, the world's top minds have been tasked with creating more devious and devastating ways of waging war. The time for diplomacy has long since passed. The time for advanced warmongering is upon us. One of the biggest differences from the classic game is the addition of commanders: land, naval, space, nuclear, and diplomat. These fill a number of roles with the most basic function being to act as an improved army unit, enabling players to roll eight-sided dice rather than the typical six-sided, but perhaps the most important function of the commanders is allowing the purchase and use of cards of various types. The addition of these cards, and in particular the addition of the Advanced Tech Command Deck, has a huge effect upon the gaming dynamics. 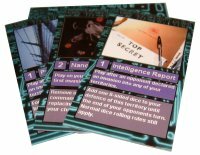 With the addition of these Advanced Tech Command Cards the board is opened up making no position impregnable and no attack a certainty. With these cards in use, the game is more fluid, with gaming positions and strategies needing to be constantly shifted.